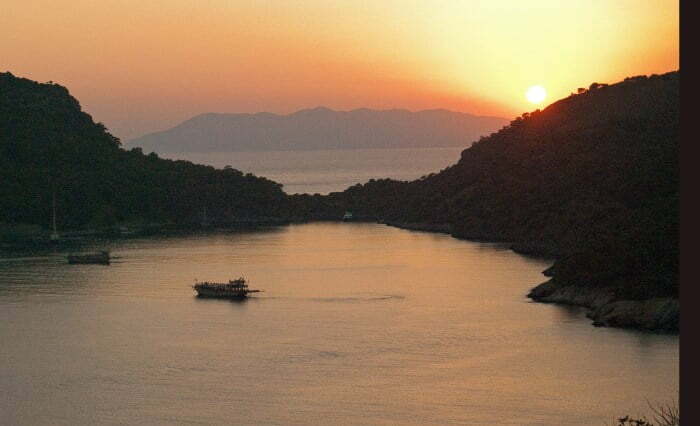 Gemiler Island, off the coast of Fethiye means “Island of boats” in English, but the other name for it, is Saint Nicholas Island. Saint Nicholas, also known to the Western world as jolly Santa Claus was the patron saint of sailors, hence the connection. 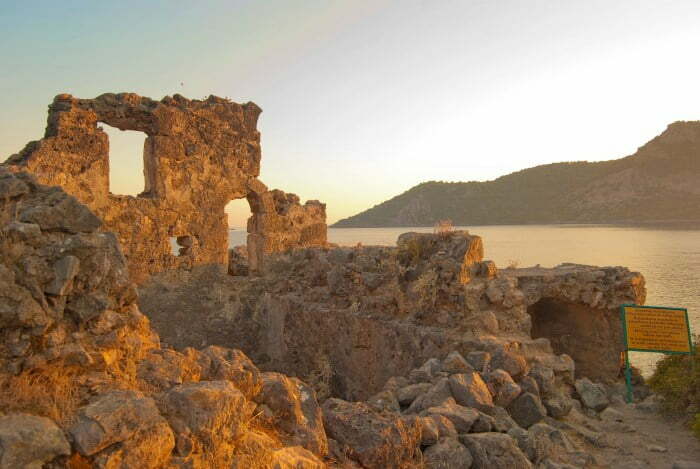 In 1993, some archaeologists suggested that Gemiler Island is the original location of Saint Nicholas’s tomb. Apparently it was moved, to Demre when Arabs invaded the area but this is another story. These days, the small island is overgrown with greenery, uninhabited and home to the ruins of five churches dating from the 4th, 5th and 6th centuries. 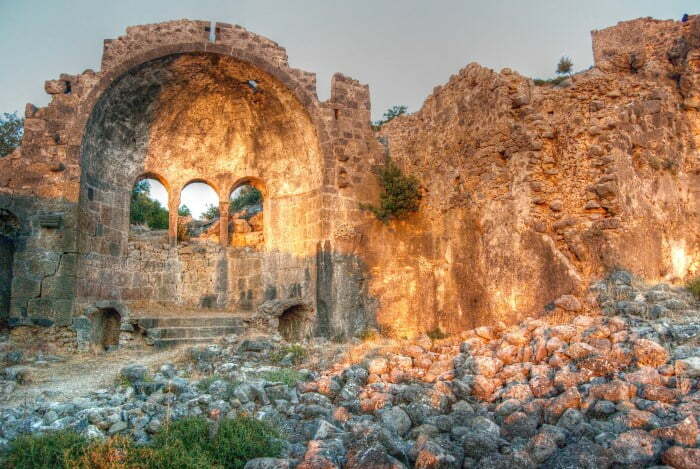 I saw the ruined churches, ancient vaults and tombs but for me, the highlight of Gemiler Island is not the ruins. Instead, I was lured by the vibes of the yachting scene. Fethiye is a centre for Blue Cruises of the Turkish Riviera and Ali from the yachting company My Blue Cruise had suggested I do a four day, three night cruise. I boarded a five-berth, stunning boat, complete with all modern cons and a full crew. I was instantly impressed by the boat but had no expectations of the next four days. I have since realized, that is a key factor when traveling. If you don’t have expectations and go with the flow, it becomes a more memorable experience. Life coaches often refer to this as the “art of allowing”. So we spent our first day sailing the coastline before dropping anchor in Gemiler bay for the night. I saw other large and small boats doing the same and it seemed that I had entered a yachting mecca. After a briefing from the captain about Gemiler and the agenda for the evening, the cook rang the ships bell to signal that afternoon tea and biscuits were ready. At this point, I started to really appreciate the moment. After all, I was on a stunning boat in the Mediterranean, being served on hand and foot while looking at a beautiful landscape, devoid of urban ugliness. Feeling a physical and mental release of tension, I went for a short swim in an attempt to reach the island. Near the shore, the depth was shallow and strong waves slapped against the rocks, forcing me to turn back. That wasn’t a problem because instead a member of the crew took us across to the island in a speed dinghy and all the other boats were doing the same. Crowds were disembarking at the jetty and heading up the winding path to the top of the island. We all had the same aim. Crews had spread the word to passengers that the sunset was best viewed from the top of the island. It was stunning. So I explored, watched the sunset and returned to the boat. My story isn’t over yet though. I’ve briefly mentioned the cook, who served afternoon tea and biscuits. It turned out; he was a culinary genius at evening meals as well. After drinking copious amounts of cheap beer, it was time to sleep but due to the heat, every passenger slept on deck. As I looked up at the night sky, I heard crickets from the island, then the gentle sound of the sea lapping against the boat. Occasionally, I heard people from the other boats laughing and joking. In the moment, I realised, it had been a long time since I felt contentment and peace like it. 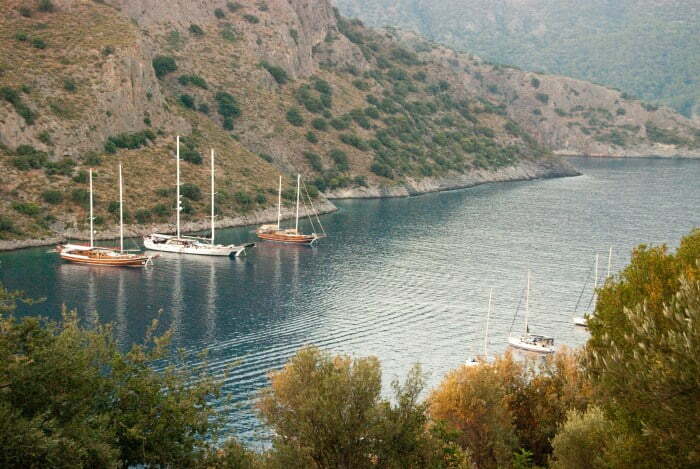 Within one day, I was hooked on the yachting scene of Turkey. It is impossible to be on a Blue Cruise of the Turkish Riviera and not feel truly blessed in life. Now, when I read a random list of “Things to do in Turkey” and a Blue Cruise is not listed, I roll my eyes and tut loudly. The Turkish Riviera has gained itself a hard-core fan for life. Explore the website of the company I travelled with, My Blue Cruise. They have a range of tours including budget and luxury. A small beach is opposite the island but it is receiving mixed reviews on Trip Advisor. People complain about hefty prices in the nearby restaurant. 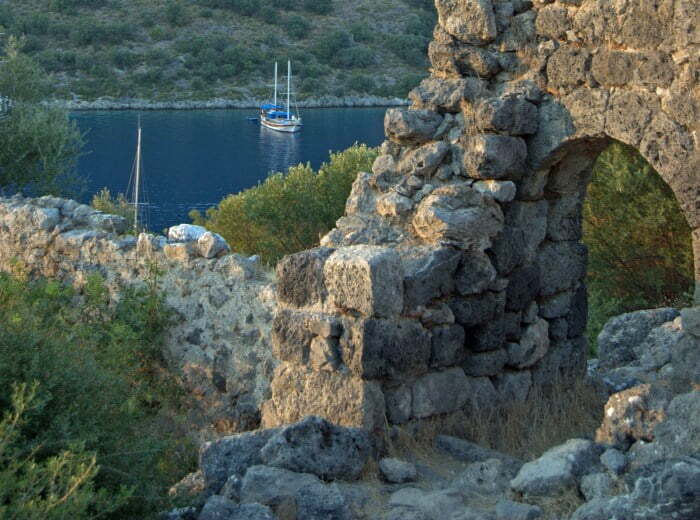 Question for Readers : Have you been to Gemiler Island or Beach? If so, did you have an enjoyable experience? by the way, it really hurts when I come back and see my comments are not published..
You won’t be sorry Valen!